IR Remote controls both displays; plays Jingle Bells; and adds people to the Naughty and Nice lists. I soldered one of the I2C address pads on one of the 8×8 Matrix LED to differentiate displays (0x70 and 0x71). I used an antique wooden glove box as the project box. The video demonstrates the simple functions of this fireplace decoration. I’ve started work on a new version of my alarm clock. 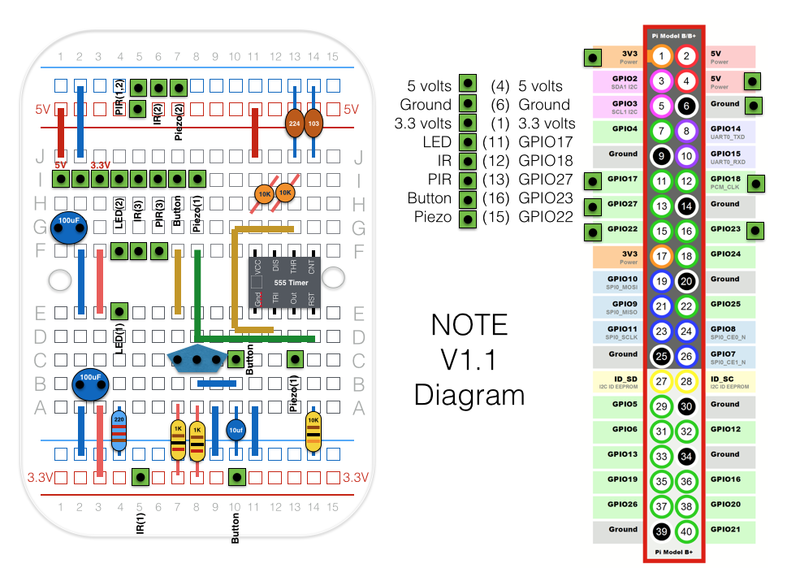 I wanted to add a couple of improvements to the first version which was based on an ATMega328pu processor and NRF24 radio. This version would use an ESP-1 for both communication and standalone configuration. 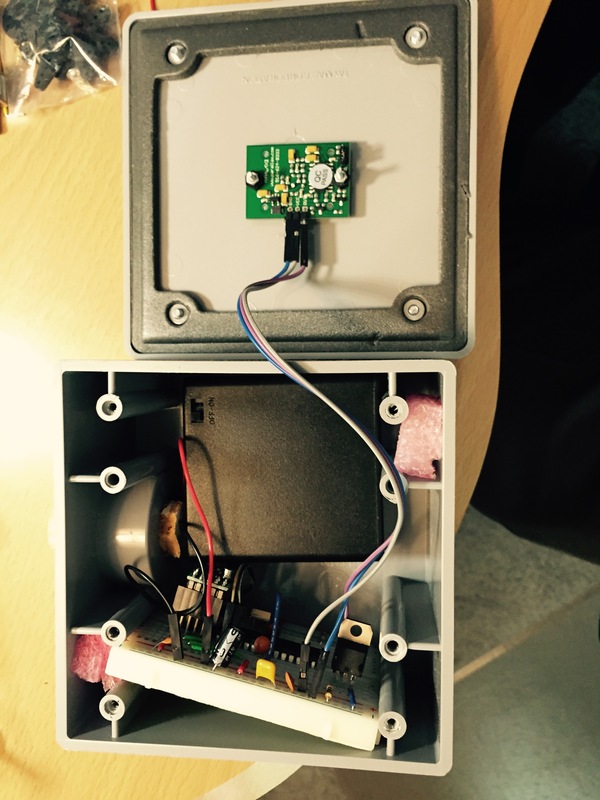 The OLED can be hidden and only needed at startup to determine the status of the system and to show the IP address of the device. 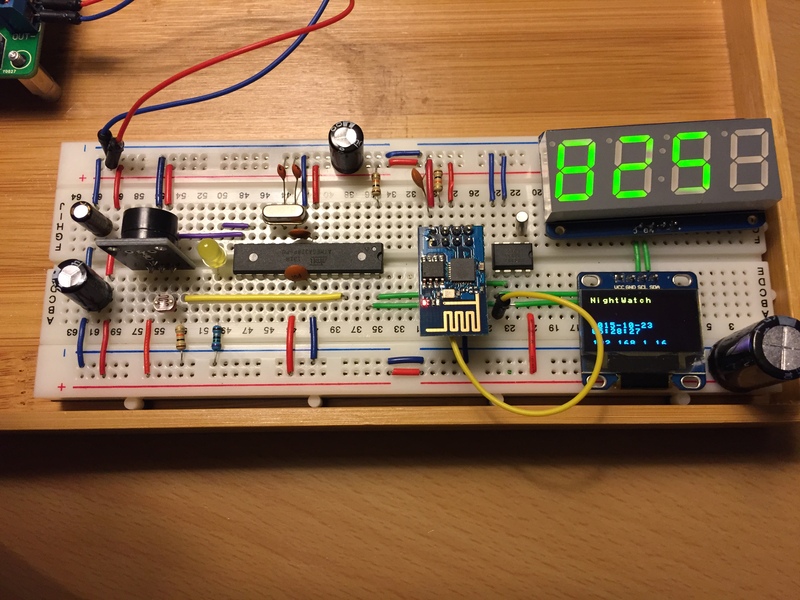 ATMega328 handles all analog and digital devices. A simple web form is used to (a) manually set date and time; (b) set the alarm time; (c) enable the alarm clock and (d) sound a system alarm. The video below demonstrates the basic features using the breadboard design. The next step is to complete the software development and move everything to a protoboard and antique box. I wanted to add video surveillance to my home automation project, which was a good excuse to add another Raspberry Pi to the project. I’d tried using an ATMega328 with the Pi but found it too cumbersome to write Python code and Arduino ATMega code. It worked with an I2C interface but I wanted something simpler. The diagram below illustrates the Adafruit photo-board with all of the necessary interfaces to 5 volt and 3.3 volt devices. I enclosed the project in a plain wooden box. As you can see the cable management was a hassle with the hinge and external interfaces on the door. I will publish the code to GitHub when I get a chance. 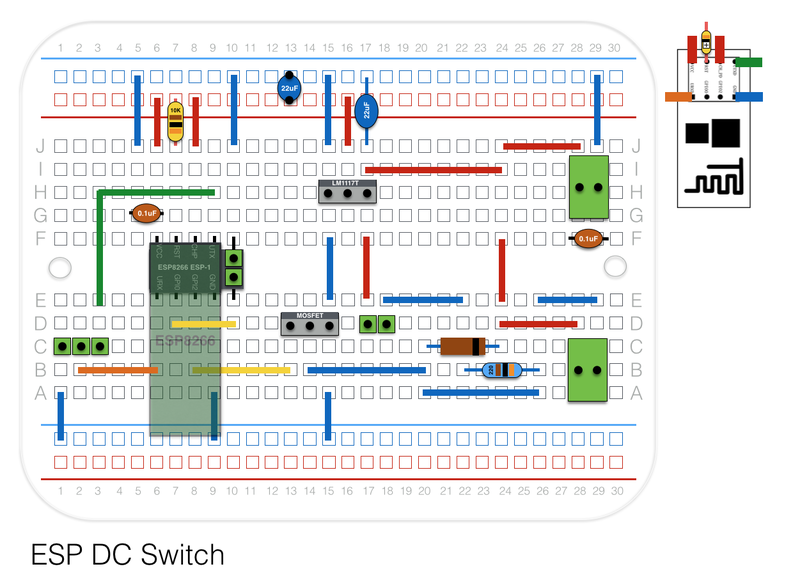 Continuation of my ESP8266 DC power switch. Once I had the breadboard working I soldered the components onto an Adafruit Proto-Board and enclosed the electronics in an antique wooden box. I’ve been combining the “old” with the “new” by reusing old or antique wooden boxes as my Arduino, Raspberry Pi and ESP8266 projects. The next version (there are always things to improve) will use a 220 Ohm resistor for the LED indicator. I will also add some type of relay for an AC version. I really like the cloths pin box which I found in an antique store in Kalispell, Montana. The diagram depicts a modified version (new 220 Ohm resister, etc.) of the proto-board solution. I’ve also added pins to support debugging on the proto-board by providing RX, TX and GND pins from the ESP-1. Another recent project is a cat entertainment center using a combination of servo controlled mice and feathers. For the prototype I used a wooden wine case (6 pack) and inserted 1-1/2 inch tubes and servos for two mice. A slot on the side uses another servo to pop out a feather. It has been very popular with Nebbie, our six month old kitty. One of the challenges was to make it robust enough to handle abuse from the kitty while at the same time “NOT HURTING” my kitty. Nebbie has pulled out the servos several times. She also runs over to the box as soon as she hears the servos power up. This is a prototype of my battery powered PIR motion sensor unit that I have on my front porch. It has run for several months on 3 AA batteries. 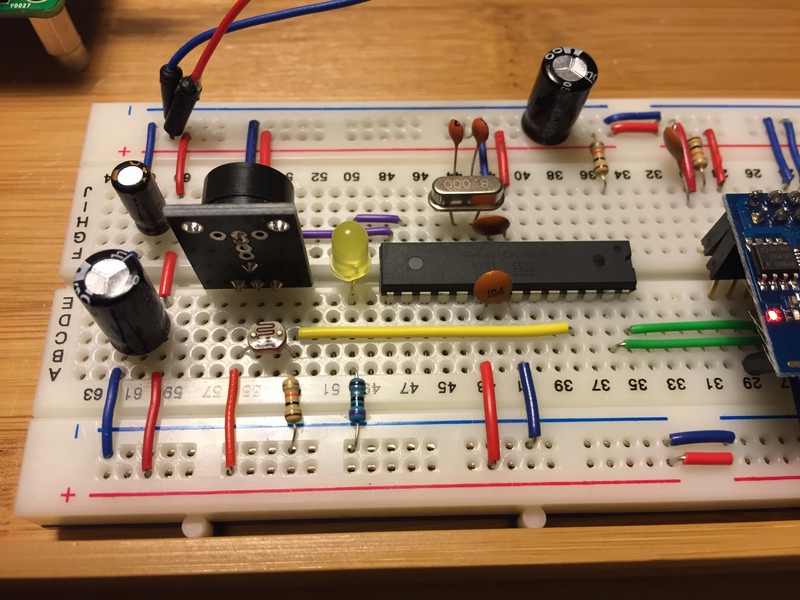 Larry gave me the idea to use the PIR output to drive a MOSFET power switch. I’ve run this device for more than 3 months and it works great. 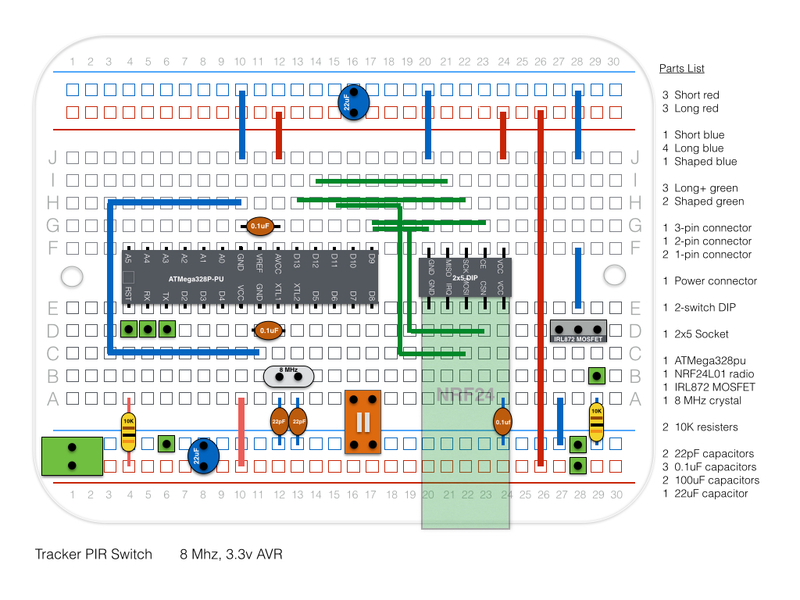 My next prototype will use the same idea but replace the ATMega328 and NRF24 with an ESP-1 Wi-Fi client. 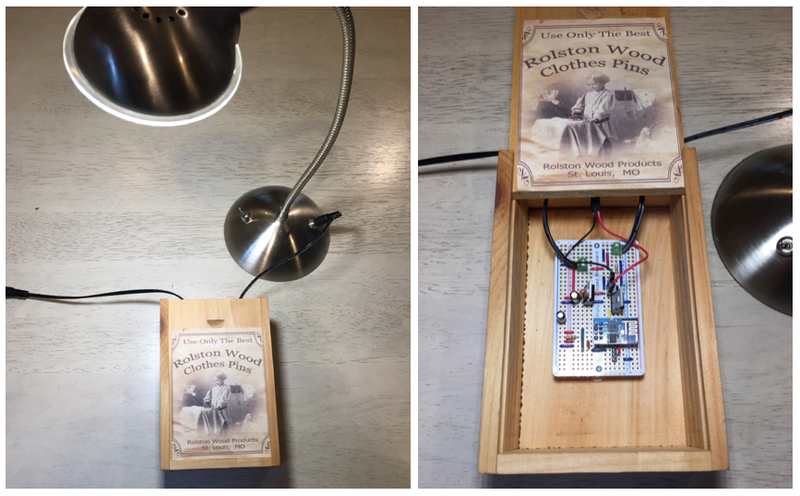 Another recent project with the ESP8266 was my Wi-Fi controlled light switch. I had a couple of LED desk laps that I wanted to control remotely from my Home Automation iPhone app. 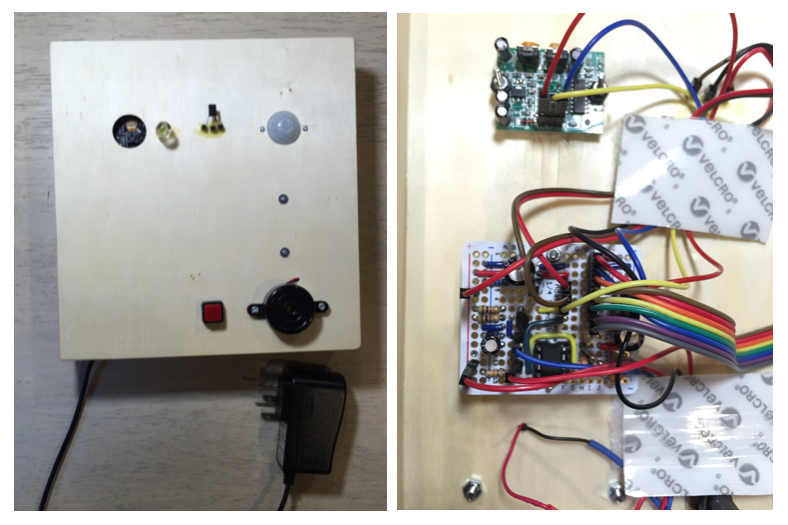 This is a video of the first breadboard version of the light switch. 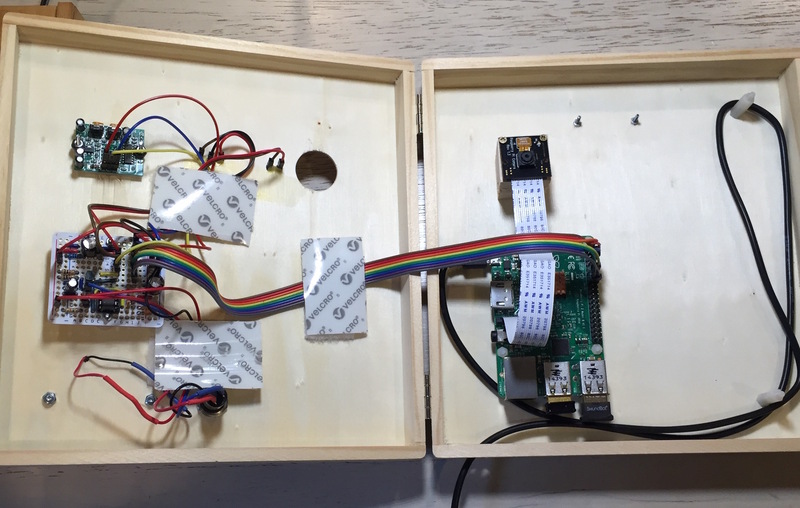 The next step is to create a more permanent protoboard (Adafruit product) and enclose it in an antique wooden project box. I’ve recently started working with the ESP8266 model ESP-1 Wi-Fi web server, web client and access point. It is an incredibly powerful microprocessor with an equally powerful Wi-Fi radio. Its 32 bit, 80 MHz processor has lots of memory (compared to my ATMega328) and at around $2 US, its hard to beat. 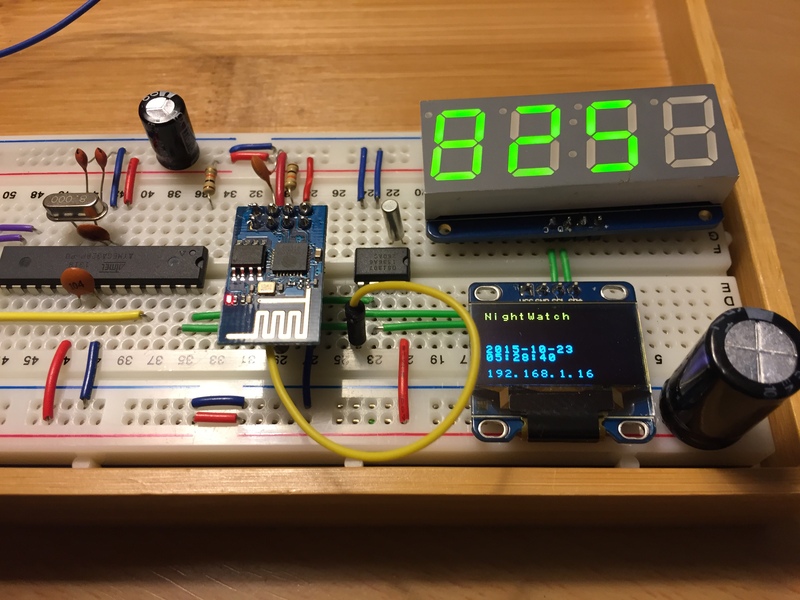 You can use several different development environments but the ESP8266 community has ported it to the Arduino IDE. I’ll post a few of my most recent prototypes in the next couple of days. I’ve spent the last couple of years learning digital design with the Arduino platform. The open source hardware and software communities have been immensely helpful and I could’nt have made much progress without their help. I decided to use home automation and motion surviellance as the central theme for my self taught, hardware design education program. Today, my home has many sensors collecting data in each room and communicating status to my iPhone via Bluetooth devices. 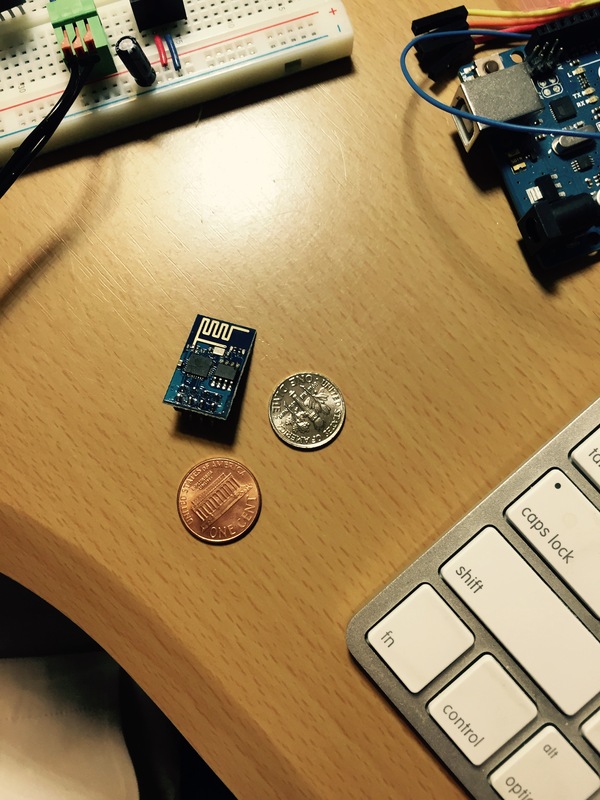 I’ve used an nRF24L01 2.4 GHz radio in a mesh network to coordinate each device. 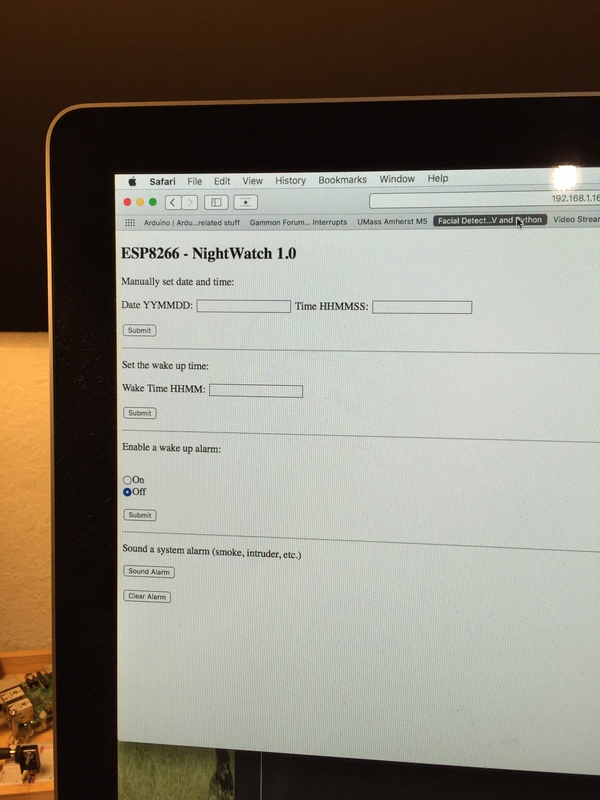 I will document version 1.0 of my home automation system on “parttimemaker”.